H&M was one the first brands to sign the Accord: a legally binding agreement between brands and trade unions to work towards a safe garment industry in Bangladesh. Yet despite this early commitment 55% of H&M’s factories are still not safe for workers and 13% of theirs suppliers in Bangladesh still have locks on the doors of their fire exits. With 205 out of 229 suppliers behind schedule, the ongoing safety delays at H&M’s suppliers is unacceptable. The few H&M supplier factories can be called safe is the shocking reality of an industry that is dysfunctional and exploitative. 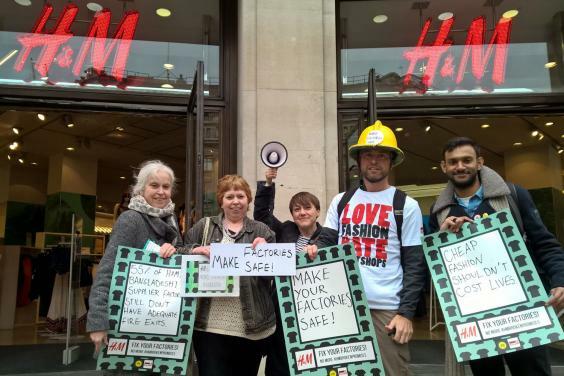 If H&M can continue to reap profits, its workers should be working in safety. It’s really that simple. On 18th April Labour Behind the Label travelled to London’s H&M store on Oxford Street along with supporters and our friends War on Want to demand that H&M fix their factories. We think H&M along with other big brands and their suppliers have a responsibility for their workers. No worker should go to work everyday with fear of their safety and for another Rana Plaza disaster. You can still tell H&M to fix their factories.